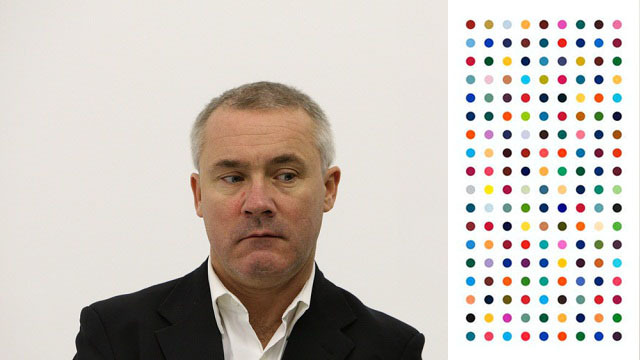 Recently we found out that anyone who sees all of Damien Hirst's spot paintings will win a print valued somewhere between $3,500.00 and $50,000.00. Greg Allen believes making the trip would be hellish - but he has two daughters and needs to be back home in time for the school play. Felix Salmon did the math for an imaginary plutocrat making the trip in gilded age style (sans private jet) for $108,572.00. UPDATE: Courtesy of AirTreks, we found a better rate. It includes a stopover in Kuala Lumpur for a little pool/tropical cocktail downtime. Eames furnishings and a rooftop pool, what more could you possibly want? AirTreks itinerary is missing the Geneva stop. We are taking the train from Paris to Geneva and back. No need to fly that short route. It's included in the transportation cost. This was specified in our last post with the Expedia itinerary. The first spot print is up for sale at the Phillip's Auction in London this coming Wednesday 2/27. See Red: W.A.G.E. Asks "Why Are Artists Poor?"